June Freels farmed acres of asparagus at the edge of Butler County where Ohio bumps into Indiana. Just minutes into the rolling countryside west of Oxford, I turned into her long dirt drive and pulled up to the farmhouse. June bounded out the back door and headed for the barn where an old fridge held the day’s picking. “Just had creamed asparagus on toast for lunch,” she chirped as she doled out my ten-pound order. I handed her a twenty, patted the doggie admired the blooming lilac and drove back to town. . .
Creamed asparagus, or asparagus served in a light white sauce was once the most common way to serve the spring bounty. Back then no one roasted, grilled or shaved raw asparagus into salad. It was invariably well cooked and sauced, served on country tables where the green spears were often foraged in spring from fencerows, ditch banks and along train tracks. Restaurants opted for fancier Hollandaise sauce, but our old béchamel (first of the mother sauces) held forth for everyday fare. A little butter, a little flour plus warm milk whisked up in minutes makes a light gravy to bind tender, sweet asparagus. A sprinkle of fresh dill if it’s in the garden, a twist of pepper and a slice of crisp buttered toast make this a comforting vegetarian lunch. Add a welcome boiled egg to lift the humble dish. The asparagus time of year is here again with abundant bundles on offer in all our Midwestern farmers’ markets. Here near Chicago we often see the purple variety which has become my first choice for flavor. I always opt for the thick stalks which grow from mature roots; they’re the sweetest and most tender. Every now and then it’s fun to fold some fresh asparagus into a white sauce, spoon it over a slice of crusty sour dough toast, and tip a fork into a taste memory worth bringing back. Melt butter in heavy saucepan. Whisk in flour and stir for a minute to cook the flour. Whisk in hot milk and simmer to form a smooth sauce. Season with salt, pepper and nutmeg. Taste to correct seasoning; add a few drops fresh lemon juice if desired. Set aside. Bring a pot of water to a rolling boil. Trim any tough ends from the asparagus and diagonally cut into half-inch slices (you should have 4 cups). Salt the boiling water generously and blanch the asparagus for 3-4 minutes or until tender. Make sure to cook it a bit longer than the ‘crisp-tender’ stage. Reserve half a cup of the cooking water and drain the asparagus. Warm the white sauce and thin it if necessary with some of the cooking water. Add the drained asparagus and heat it through. Fold in a tablespoon of chopped fresh dill or parsley. 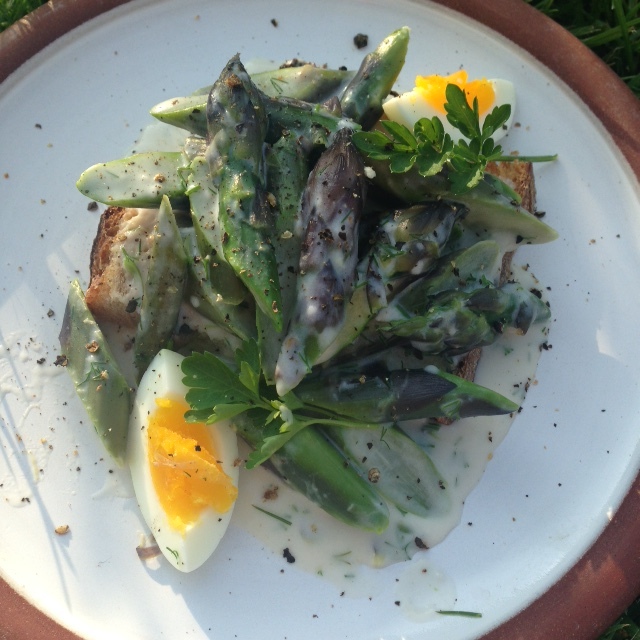 Spoon the creamed asparagus over warm, buttered toast and garnish each serving with quarters of boiled egg. Sprinkle with flaky salt, cracked pepper and fresh mint, parsley or chives. Serves 4. 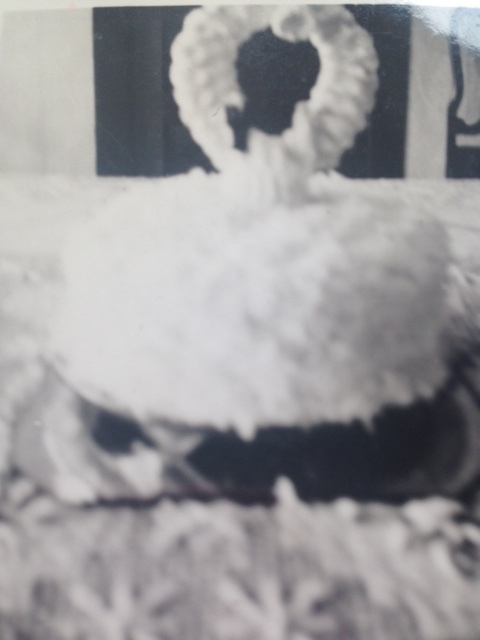 In a ragged string-bound photo album, there’s a small picture of my Mom and Dad’s wedding cake. It was only two nine-inch layers robed in a marshmallow cloud of icing and veiled with freshly grated coconut. In the center of my grandmother’s lace tablecloth, this special little cake marked the family celebration in January 1940. 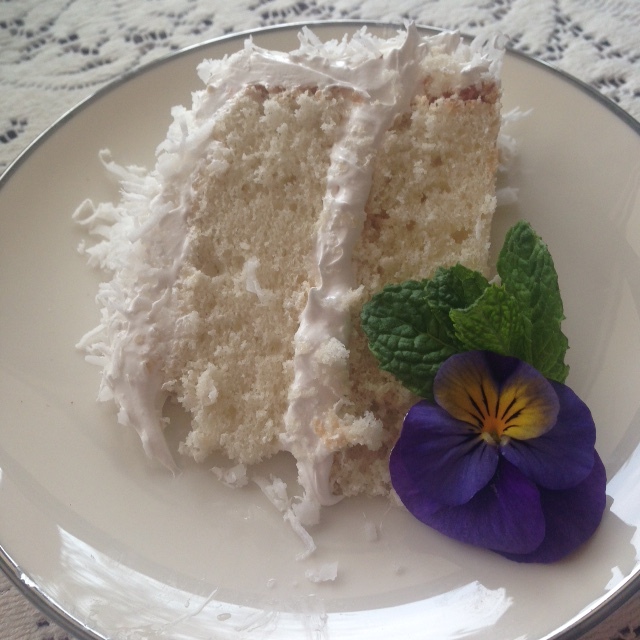 For as long as I can remember, a coconut cake was our family favorite. 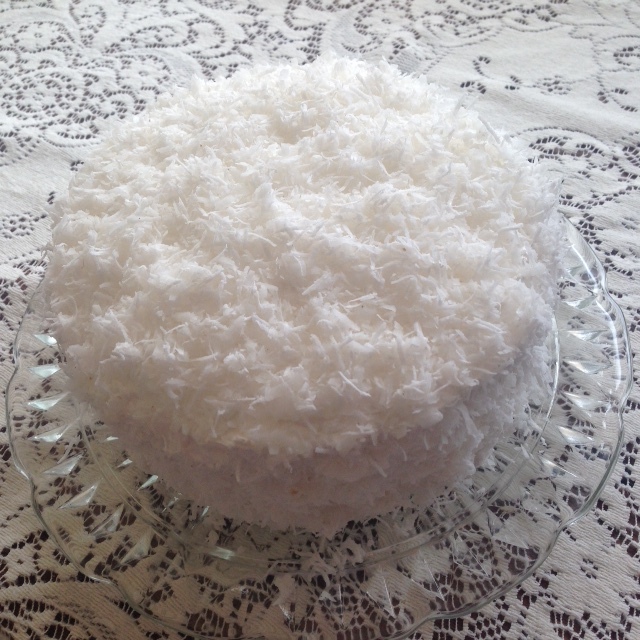 For birthdays, anniversaries or even Christmas, coconut cake was a star. Then it seemed to fade away. Everyone started using cake mixes and faking the cake with tinned icing and packaged coconut. It just wasn’t the same. I even recently bought a slice of a coconut cake elegantly displayed in a prestige bakery, and after a bite dumped it in the garbage. As the keeper of the few old family recipes I’ve been able to save, I still have the coconut cake written out on a small file card in my grandmother’s hand. Occasionally I take it out, and think about making it for the now. Instead of white shortening, I use butter and in place of juice from a coconut, I use canned coconut milk. Sometimes I substitute whole eggs for the egg whites and I leave the grated coconut out of the batter for easier slicing after it’s baked. The perfect frosting for this cake is a swirled cloak of boiled or seven minute icing. If that icing seems too sweet, and the cake can be held in the fridge, it may be frosted with lightly sugared whipped cream and coated with sweetened dry coconut. If the cake needs to stand at room temperature, then go for the traditional boiled icing and if at all possible, use grated fresh unsweetened coconut. Made into tiny cupcakes, this cake makes sweet, light bites and a small slice of a layered cake will take you back in time. Coconut Cake Slicewill take you back in time. My parent’s marriage lasted for over sixty years. It was a rough road most of the way, but their cake remains the very best. * There are many excellent brands of coconut milk from Thailand; I use Chaokoh. Freeze excess for later use. Preheat oven to 350°. Line two 8 or 9-inch layer cake pans with parchment circles; butter and dust with flour. Tap out any excess. Or line 48 mini cupcake molds. Cream the butter and sugar until very light and fluffy (use a stand mixer and beat at least 5-6 minutes!) Meanwhile measure flour, baking powder, salt and sift together twice. Once the butter and sugar are softly fluffy, add the egg whites one at a time, beating well after each addition. Reduce mixer speed and add flour mixture alternately with coconut milk. Scrape down bowl and beat at moderate speed 5-10 seconds. Divide batter evenly between the prepared cake pans and bake in the preheated oven for about 25 minutes (15-20 min for minis). The cake will test done when it is lightly golden and pulling away from the sides of the pans. Allow cake to rest in the pans for 5 minutes then turn out onto a wire cooling rack. Make sure the layers cool parchment side down. Place egg whites in spotlessly clean bowl of stand mixer with whisk attachment. Combine sugar, cream of tartar, salt and water in small saucepan. Swirl over moderate heat to dissolve sugar. Cover until syrup comes to a boil and steam down any sugar crystals on the sides of the pan. If sugar crystals persist, dip a pastry brush in water and wash down the sides of the pan until clear. Bring the syrup to a strong boil and cook to the firm ball stage or 240°. You can easily test the thickening syrup by putting a few drops on an ice cube; as it cools roll it into a firmish soft ball. As the sugar approaches readiness, turn on the mixer. Whip the egg whites to a soft foam. When the sugar syrup is ready, hold the saucepan high above the mixer and pour the hot syrup in a thin stream gradually into the egg white foam. Take care to pour the syrup from a height so it hits the egg whites between the whisk and the bowl and doesn’t spin around the beater. This boiling hot syrup will cook the egg whites into a stiff Italian Meringue. Continue to beat at high speed for a few minutes until the meringue is very stiff and slightly cooled. Add vanilla and beat to combine. You are currently browsing the Mary Jo's Kitchen blog archives for May, 2016.